Supernovae, as I mentioned in my previous post, are among the most powerful events in the entire known universe. There are even a few different types — Type Ia happen when a greedy white dwarf accumulates too much mass, Type II when a massive star’s core collapses, and Hypernovae which are thought to happen only to the most massive stars in the universe. I’m going to concentrate on Type II in this post, just for simplicity’s sake. Well… that and the fact that I don’t know as much about white dwarfs. A supernova is an awesome event, in the truest sense of the word. One star will, briefly, shine with the light of one hundred million suns, outshining it’s parent galaxy. From a distance of around one light year, it would appear every bit as bright as the Sun does from Earth. As it’s light spreads out at 300 million metres per second, it will eventually be visible amid the galaxies, from the other side of the universe (at least, assuming no big dust clouds get in the way). Of course, light actually travels relatively slowly on cosmological scales. 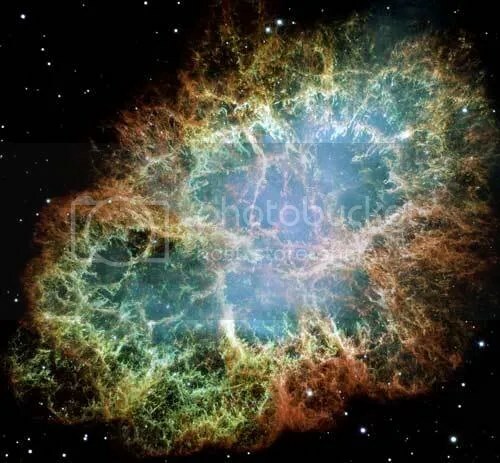 In fact, although the beautiful crab nebula pictured here is the remains of a supernova seen on Earth back in 1054AD, there are stars in the outer arms of the Milky way who haven’t even seen it explode yet. One of the stars I’m working on won’t see the light from the crab nebula supernova for another 199 thousand years. Quite humbling, really. So what exactly makes a star’s core collapse? Stars are powered by nuclear fusion. Two atoms of hydrogen fuse to form helium, three of helium fuse to form carbon and so on. The more massive the star, the heavier the elements it can make. The trouble comes when an old massive star starts to run out of fuel it can work with. Left with a core of pure iron, the star attempts to fuse it further. Unfortunately, once fusion starts, the star’s core becomes too dense, unable to resist it’s own gravitational pull. The star’s core collapses at a speed of 70,000 km per second — that’s over six Earth diameters every second! — and the star’s entire mass starts rushing inwards to follow. This continues until the star’s core is supported only by ‘neutron degeneracy pressure’ as a tiny object just 30km across that weighs easily as much as the Sun. Eventually, this will become a neutron star — the tiny fading corpse of a once mighty beast. The sudden release of gravitational energy from all of that falling star stuff heats this little ball of neutrons up to an insane 100 billion degrees. Far too hot for even neutron degenerate matter to be stable. To reduce it’s energy it releases a sudden burst of high energy neutrinos which carry away 1046 joules of energy (equivalent to around 10% of the star’s mass) in around ten seconds! Ten seconds! Just think about that for a moment. 1046 joules in ten seconds makes one billion octillion gigawatts or one sextillion yottawatts of power. Needless to say from the unusual names of the large numbers involved, that’s enough energy to be difficult for a human being to fully comprehend. That burst of neutrinos is the main output in the supernova. In fact, it actually dwarfs the fact that the mass of an entire star, falling inwards, impacts against the now solid neutron core of the star and actually bounces off it, resulting in a tremendous shockwave. With the extreme forces generated by this shockwave, fusion just goes crazy. Anything and everything that was once star material starts to fuse together haphazardly, creating all sorts of strange isotopes that simply cannot be created any other way. Heavy, unstable and unique elements. In fact, supernovae are the only natural means of creating uranium. Just imagine that. Fission reactors are simply releasing energy that was stored in uranium nuclei by a supernova aeons ago, before the Sun had even formed. The Earth’s core too is partially heated by the radioactive decay of heavy isotopes. The fire from that supernova is still burning and in a sense, it’s helping to keep our entire planet alive. This entry was posted in Imported from Livejournal and tagged astronomical images, neutron stars, supernovae. Bookmark the permalink.